"Restaurants that echo with history are getting harder and harder to find in Los Angeles. Change is inevitable, but it also creates a longing for permanence. Finding a hidden gem often presents a dilemma of whether to share it with those who will also care, or to keep it secreted away from potential oversaturation. But shining a light on things that matter can in the end help preserve them. 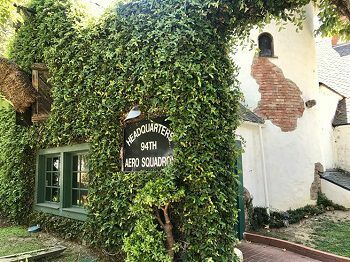 The 94th Aero Squadron Restaurant, located in a remote and tucked-away place at the Van Nuys Airport, needs to be preserved and celebrated. Opened in 1973 by David Tallichet, a World War II Army Air Corps veteran, as a means to share his love of all things aviation-related, the restaurant was modeled on a rustic Normandy farmhouse. Tallichet chose a spot on the sidelines of the airport's long, straight runway and named it after the 94th Aero Squadron, a much revered U.S. Army Air Service unit during the first World War. A sense of vintage magic abounds. Ivy wraps around white-washed and exposed brick, and a World War I propeller plane sits flirtatiously on the front lawn near vintage war Jeeps, a cart full of baled hay, some cannons and an honest-to-goodness World War II ambulance. Upon further inspection, gaping holes can be seen on the roof of the far end of the restaurant. You wonder what accident may have occurred here, until you find that this is merely the open-air patio roof, intentionally created to resemble a bombed-out Normandy bunker."